If you’re a mid-life, mid-career executive or professional, career change may feel like you’ve gotten lost with Dorothy in Oz. You’ve achieved success in your career. You’ve built skills and a strong work ethic. And now you’re ready to move on…and it’s not working. Twenty years ago, you probably didn’t have a cell phone or an email account. A worm was something you put on a fish hook and a virus was something you caught from visiting friends. You could bring your whole set of kitchen knives onto an airplane and gas prices…well, we won’t go there. Today as many as 90% of workers wish they could find a new career, but few actually succeed. Most are held back because they’re still guiding their progress by what they learned when they begin their careers, 20, 30 or 40 years ago. Myth #1: Science supports the traditional linear career change model: test for interests, identify careers and go find a job. But researchers at Stanford and Harvard have found that career exploration proceeds in a zig-zag trial-and-error path. The word “serendipity” has been used in mainstream career research journals. Action, not introspection, is the key. Myth #2: Starting a business is riskier than seeking a new job. Reality: I would never tell anyone, “Stop job hunting and start your own entrepreneurial venture!” But these days, I recommend moving in parallel paths. Keep looking for a job but get serious about self-employment. If you have a high profile in your industry or community, you may have trouble getting hired – but you might find yourself in demand as a self-employed business person. And if you’re above a certain age, you may meet resistance from the traditional job market. Myth #3: Skills that brought you career success are the same skills you need for career change. Reality: Career and business achievement calls for football skills: teamwork, planning and playing your position. You get rewarded for being in the right place at the right time. 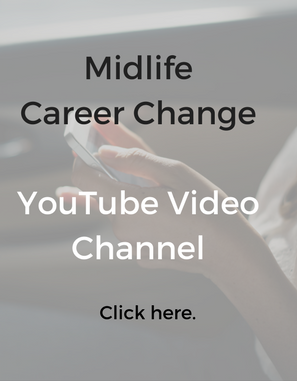 But career change typically happens like playground basketball. Your biggest successes will be unplanned. The rules change and if you want a team, you will have to find them — or even hire them. Myth #4: Ignore unexpected thoughts like, “Maybe it’s time to move.” They’ll soon go away. Reality: These hints come from your intuition, which is not a woo-woo concept but a reliable source of insight that has been recognized by mainstream psychologists and scientists. When you ignore these whispers, you may find yourself sabotaging your own success. Myth #5: Make tough career decisions like business decisions: run the numbers. Myth #6: Fear is a signal to stay where you are, not challenge the status quo. Reality: Contemporary psychologists recognize that fear can be your friend, especially when you’re moving outside your comfort zone into a new adventure. Fear means you’re taking care of yourself as you move into the unknown. Sometimes you will work in and through the fear. And sometimes you experience fear for a good reason: time to gather more information before moving ahead. Myth #7: Career change means feeling stressed and miserable. Reality: Career change can become a source of meaning and growth. Most people look back with gratitude on this time in their lives. 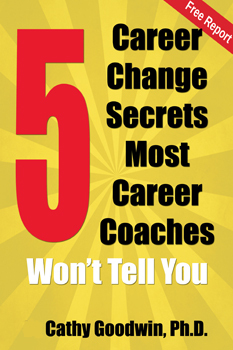 To begin, claim your free report, Career Change Secrets Most Coaches Won’t Tell You. It’s designed to help mid-career professionals take their first steps to making any kind of change. You’ll see why the old myths don’t work now (and some never did). And you’ll learn more about me and how I work with clients like you. If you’d like to work with me one-on-one, please visit this page or for a limited time, check out this special consultation package. If you wrote that terrific review in 2009 of the Third Chapter of Life book–thanks! Really appreciated that, AND the great myth busting material right here. I did indeed write that review! Thanks for coming to the site and commenting. And I’m still in myth-busting mode all these years later!